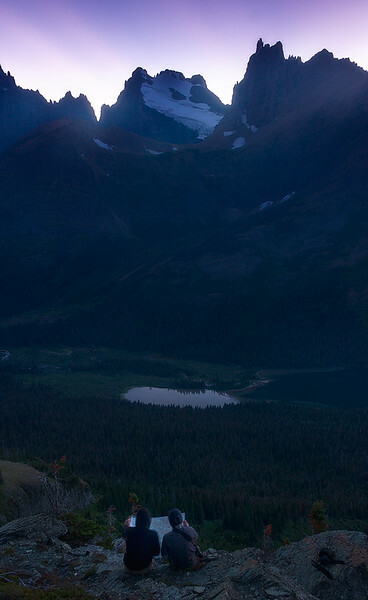 Topomapping tomorrow's hike and some shooting locations in Glacier National Parks backcountry. In the coming weeks I'll be putting out a blog post featuring all of the minimum requirements you need as a photographer to get into the world of backpacking. I waited to long to start backpacking because I was overwhelmed by all of the equipment I would need. In all reality it took over a year to get everything I needed for all seasons. This was a trial and error method of coming home from a trip and going through my pack to remove the stuff I never used, and purchase something that would make my life that much easier. Now that I've got everything down I'd love to share some of these tips with you all so you can start an adventure of your own. The post will include gear for all seasons that you need at minimum to get started. The up front cost of getting everything you need is somewhat steep, but when you look at it the overall costs is much less than a single vacation where you stay at a hotel. Backpacking gear lasts for a long time if you get the good stuff, so I highly recommend the upfront investment of quality gear that will last for years.